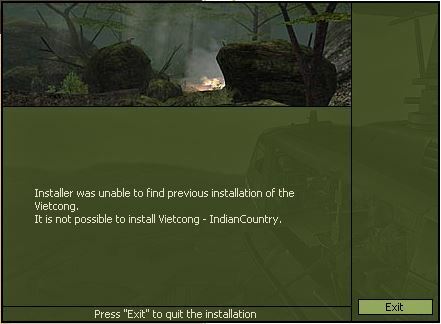 View Thread: "Installer was unable to find previous installation"
"Installer was unable to find previous installation"
I've been trying to install Indian Country and Three Canyons maps to my version Vietcong 1.65. Have VC Starter working great with Win 7. There must be another way? Does anyone know where I can download just the DAT and CBF files? Any help or suggestions are welcome! wow martyr, never heard about these problems. Really interesting. 2. Reinstall is never the solution! Don't reinstall Vietcong when its not needed. 3. "Vietcong1.65" ? U mean vcstarter1.65? U should use Vietcong Fist Alpha 1.6. 4. This are official MP maps by Pterodon, they are not in the Map folders. 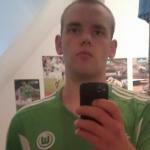 Thanks for your reply - and for the links and help you provided. I never actually installed Vietcong on this C drive I have now. I actually just copied the folder from another C drive that was running Win XP. So there was no Windows Registry entry for the game and this is what the map installers need in order to work. A long time ago, I installed the Fist Alpha CD Rom which I bought from a shop (lol) - true. Over the years, I copied that VC folder and a couple of years ago, I installed it again (meaning that I had VC patched to 1.6) but didn't install the Indian Country and Three Canyons extra maps. Last week, I got VC starter 1.7 working. I connected my old C drive and copied the VC folder from that last installation to my new C drive (Win 7). That C drive had a regular install so when I looked in the Windows Registry: I found the VC entries. So to fix my problem, I installed the Indian Country and Three Canyons was easy cause installers found my VC and allowed the install. I realised that the version of the maps I was installing were actually multiplayer versions created by Pterodon so they built in this (uhm) security - not allowing installs to VC folders unless properly installed - but the EXE files only actually contain CBF files! So finally, I copied the CBF map files from that C drive to my new C drive maps folder and it actually worked! Anyway, problem solved. I love these two maps so am really glad. If anyone wants a copy I can share - they seem to work great with VC starter. They have great COOP mode also!